The porg invasion took way long before The Last Jedi even hit theaters, and has by now all but taken over our hearts and homes. But it isn't just their unique (and adorable) look that has made us all fall so hard for the fuzzy little residents of Ahch-To; it's also their distinct (also adorable) sound. As it turns out, the porgs were one of the first things the sound department was asked to work on for the newest Star Wars movie. As co-sound supervisor Ren Klyce told Nerdist, all they had at the start was the script. "You read about this creature, but you don't even know what it looks like," he said. "We finally got to see some actual puppets and touch them and that was really great." When Klyce and co-sound supervisor Matthew Wood saw footage of porgs in action, they talked with Rian Johnson about what he wanted the creatures to sound like. Klyce explained, "He described what he wanted to feel emotionally from them; he wanted them to not be irritating or annoying. He wanted them to be sweet and soulful, and it just came down to starting to experiment with different sounds." Klyce said, "Obviously because it looks like a bird, the first thing you go for is, 'Let's try birds!'" But no single variation of bird sound quite worked, so Klyce and Wood's team collected numerous samples, starting close to home. "Where we work at Skywalker Ranch, George Lucas has a farm," Klyce said. "He has a chicken coop, and he's got goats, and he's got all sorts of animals and horses—it's an incredible place." He continued, "So, we went down to the chicken area with a microphone and recorded these chickens and got this crazy random file. It was a few minutes long. They were kind of running around and scratching and making banging noises and stuff. You have to be patient and listen, and you can start to hear these little nuances. Then it was about taking that sound, slowing it down, cutting out the bits and pieces you don't like and kind of leaving all these little tiny jewels." They pitched and manipulated the chicken sounds to create some of the porgs' audio range, but that wasn't all. You know how people rent doves to be released at weddings? Klyce hired a "dove guy" so they could record his birds. He said, "They make this really beautiful sound: a 'coo.' And, again taking that sound and pitching it way down made it sound warmer and then taking it once it was pitched down, repeating it, and then running it through sort of an echo to make it sound like it was bouncing off the cliffs. That was one texture." The chicken and dove recordings can be heard as the porgs fly around Ahch-To or cuddle in their nests on the Millennium Falcon. Of course, the team wanted an additional sound for the creatures when they would be more alert. For that, they turned to an artificial source. "There is a bird call in there, which is this little piece of metal that you put in your mouth," Klyce said. "Our intern Nick Docter, who's from Piedmont, [California], which is where ... they have this annual bird calling contest that was on the Johnny Carson show back in the day." Klyce continued, “He's actually from this town, and there's all this pride about, 'We do the best bird calls.' And, so I thought we need [porgs] to sound pained and what would it do if it said ouch? He put this thing in his mouth and went, 'Ow, ow,' and makes this sort of weird little sound. So, it's taking all these little bits and pieces and stitching them together to make the porg sound." Keep the porg love going with these stories! 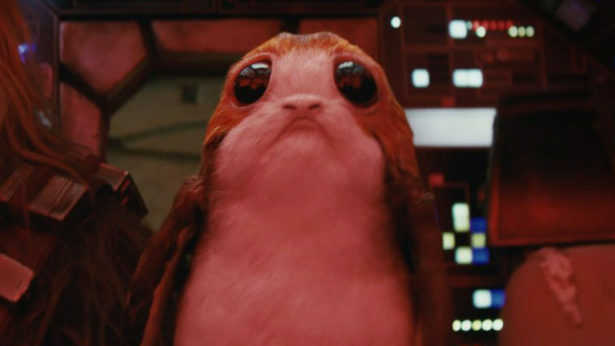 The Last Jedi's best porg moments. How to make porg cupcakes. All the best #porgnation tweets.